Interior designers Universal Design Studio have completed a 'pop-up' store in Melbourne for Australian menswear designer James Cameron. Influences include "1960’s French spy films, mid-century office interiors" and the work of German photographer Thomas Demand. The project features furniture and fittings including BarberOsbergy’s Tab lamp, Saturn coatstand and Erwan and Ronan Bouroullec’s Steelwood chair. Universal Design Studio have worked with James Cameron to create a pop-up store for the Australian menswear designer located in the heart of the inner-city Gertrude Street precinct. Inspired by a range of influences including 1960’s French spy films, mid-century office interiors and the photo-realistic work of Thomas Demand, the store explores themes of repetition, pattern and both physical and emotional tension. At the crux of the store, floating above a black and white chequerboard stone floor, over 400 spearmint coloured document archive boxes line the wall. These are reflected in the flanking mirrored planes to create a seemingly endless gridded backdrop to the store and the collection. 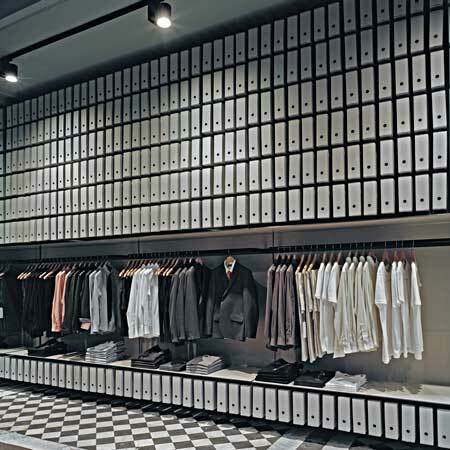 Hovering beyond these boxes, a matrix of black tubular extrusions anchors the fitting rooms below and juxtaposes with the adjacent rhythms of the archive boxes and chequerboard flooring. The colour of the archive boxes is taken as the main hue for the interior of the building, which sits on the corner of Smith Street and Gertrude Street, unifying walls, architraves, cornices and skirtings with a subtlety and depth. Sitting against this backdrop, formed from a palette limited to matt black tubular steelwork and two-tone composite aluminium panelling, a family of objects has been created to define different areas of the store. These elements comprise fitting room screens, a series of mobile consoles and the central desk. Themes of reflection and distortion are continued with the use of full height mirrors flanking the central desk and leaning against the rear wall to reflect the ceiling cornices and central roses. Furniture and fittings including BarberOsbergy’s Tab lamp for Flos, Saturn coatstand for Classicon and Erwan and Ronan Bouroullec’s Steelwood chair for Magis complete the setting.